The first semi-final in the European Champions Cup is an absolute beauty of a match-up. Ireland’s boys in blue against Wales’ wizards will kick off this Saturday at 15.30 at the Aviva Stadium. Watch on Sky Sports. The Johnny Sexton-led Irish outfit has looked the strongest side in the tournament so far. During the group stage they were put in an incredibly tough group alongside Premiership champions Exeter, current Top 14 leaders Montpellier, and Glasgow Warriors who have been immense domestically this season. Despite the level of competition, Leinster went undefeated. Their 55-19 victory in week five against Glasgow was particularly impressive. In the quarter-finals, they went up against England’s Saracens, but it was never a close affair with Leinster coming out with a 30 points to 19 victory. Obviously, the key man for them is Sexton, who continues to differentiate himself as one of the best players in the world. We can expect a world class performance again this weekend. But it should be acknowledged that they are not a one-man team. They have class all over the pitch, impressively led ahead by young forwards Tadhg Furlong and James Ryan. Then you can add Scott Fardy, Dan Leavy, Garry Ringrose, Isa Nacewa, James Lowe, and Rob Kearney to the mix. Considering they are playing at the Aviva Stadium, which many Irish players on the Leinster team call home, the Scarlets are going to have to play the perfect game to win. Unlike Leinster, the Scarlets have no recent history of being European Cup contenders – this is their first semi-final since 2007. But doubt their ability and you will be punished, because they deserve to be there and have international players aplenty across the pitch. The tournament did not start well for the Welsh side after they lost their first two opening group games against Toulon and Bath, but they then went on a four game winning streak to top the group. In their quarter-final they then beat a La Rochelle side without the hugely influential Victor Vito. This is not an attempt to belittle their achievement, because they played an impressive game against a strong French side. Leigh Halfpenny in particular was sublime with the boot, kicking 19 points. Indeed, Halfpenny’s boot could be the difference on Saturday and he is by no means the only difference-maker for Scarlets. John Barclay, Aaron Shingler, and Ken Owens are all impressive leaders. Additionally, Tadhg Beirne has been in irresistible form this year. The lock is 6ft 6in, and yet leads the Pro 14 competition with turnovers won with 37. That is 15 more than anyone else so Leinster will have to watch their former player at the breakdown. Results at this late stage of the competition are always hard to predict, simply because all the sides are very good teams. Saying that, Leinster will prove too strong this weekend winning by 26-15.
Who do you think will win and get into the Final? Please feel free to comment below. 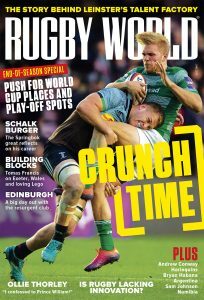 Also, do not forget to follow Rugby World on Facebook and Twitter.